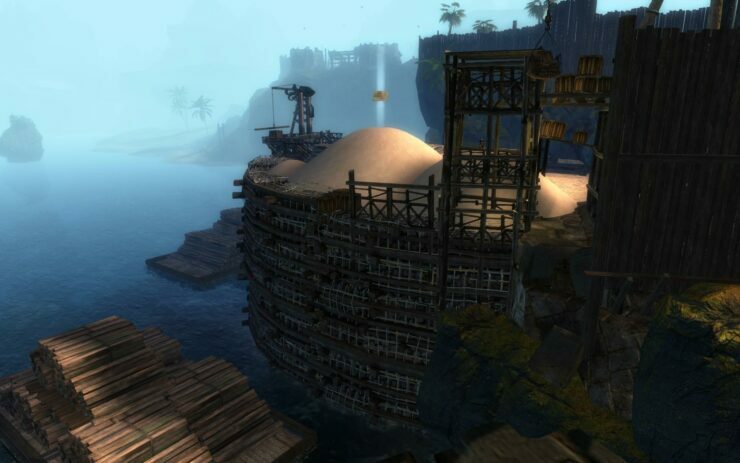 Last year as part of the living story idea that emerged in Guild Wars 2, the capital city of Tyria, Lion’s Arch, was destroyed in what was heralded as one of the most dramatic events in any MMO. In the wake of destruction, however, a new city is going to be born. Guild Wars 2 capital city getting rebuilt as part of the living story strategy. And they want you to help name the various landmarks. The destruction wrought in the battle of Lion’s Arch in February of 2014 was absolutely devastating. The very center of economy, trade and peace in the game was massacred. And since then there have been a few NPC’s that appeared fervent in their drive to rebuild their beloved home. Being in-game models, however, no actual progress was made until the last update, where scaffolding finally appeared. Well, the cat’s out of the bag now. Anyone who’s visited Lion’s Arch today has already noticed some pretty exciting changes—the increased activity of the construction workers, watchful reviews by the surveyors, assembly airships, a construction yard, and a whole lot of scaffolding! Now the capital city is planned to be completely redone in a new and imaginative way. Currently the update has added construction zones that add a little weight to the fact that its coming back. Lion’s Arch isn’t, however, going to be remodeled in the same way, but will instead be redesigned and modernized. Also in direct response to the attack that occurred, the city will be more heavily defended and fortified against any future conflicts. 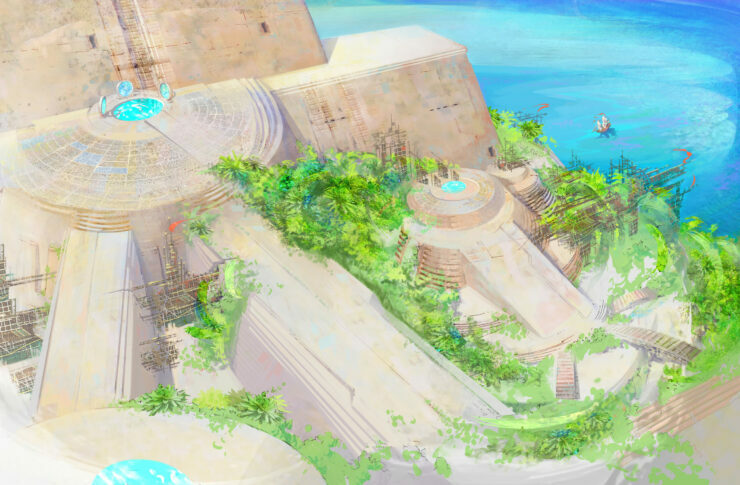 The plan of the city leaders is not to attempt to fully restore the landmark as it once was, but rather to implement an enhanced design that will more realistically serve the Tyria of today. In light of the lessons learned from the attack by Scarlet Briar and her massive airship drill, the Breachmaker, the city will be a more fortified city, with a design intended to protect citizen and visitor alike. With a redesign also comes new names for places. To that end, ArenaNet is asking the player base to help name the various new locations by participating in a poll. The living story concept was first introduced in January 2013 as a means to further inject life into the Guild Wars 2 game world. The events that unfold aren’t just static events that can be visited at your leisure if at the appropriate level, but instead are narrative based phenomenon that effect the entire game world on a permanent and dynamic basis, whether you’re playing or not. The associate director, Steve Waller, told PC Gamer back in February of 2014 that this approach had some very surprising results and was even able to evoke some emotional responses as well. The way players are attached to the world, to each other, to the characters. That’s something that we’re constantly surprised and excited about when we see it come through in the various releases, and in how players come together, how they help each other, and the true emotions players have for the game, the characters, and each other. It’s fantastic to see novel ways of storytelling within games. It certainly does pay dividends to take chances and do things different. It might even turn into something extraordinary as it did for Guild Wars 2.